When we started dating I was sure to let Mark know that this situation would be temporary. I was 18 and headed off to college in a couple of short months. I would be attending college in southern California, and had no intention of moving to California involved in a relationship. Mark assured me that he was fine with this plan, but he knew that we were going to get married and he was willing to wait for me to come to that conclusion on my own. About six weeks into our relationship I realized that Mark was someone I really wanted to be with forever. I was sure I was going crazy…I never planned on dating a military man, and here I was not only dating one but also seriously considering marriage. As I went off to college I believed in my heart that Mark and I were going to make it work long term, so we decided to stay together and make a go of it. I was living outside of Los Angeles, California attending Biola University and Mark was stationed in Charleston, South Carolina for Nuclear Power School and Prototype. The distance was difficult, but the most frustrating part of our daily routine was the three hour time difference between us. In the evening he was ready for bed and I was just going to dinner. In the mornings he was already at work when I woke up. FInding time to connect was difficult and flat out frustrating. Somehow we managed to make it work until Christmas with just one short visit in October. At Christmas we reevaluated our plan and determined that yes, we did want to be together long term, but with Mark’s Naval commitment it was going to be very difficult to guarantee that we would be in the same state in any reasonable amount of time. 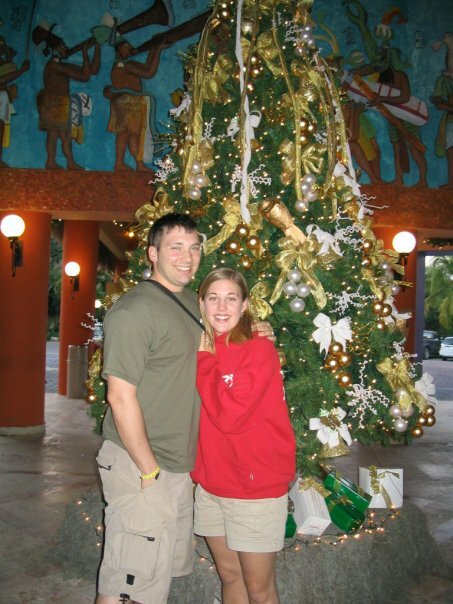 We had originally thought about waiting until I had graduated college to get married, but at Christmas we decided that with the uncertainty of life we would rather get married sooner. We mapped out the next year of our lives and realized that Mark would only have a couple of opportunities to get married and have a honeymoon in the next year, and after that it would be nearly impossible to plan a wedding until he was on shore tour, five years down the road. Not wanting to wait that long we looked at the upcoming time off…a week in March and about 4 weeks at Christmas the following year and decided that the coming Christmas would be a great time for a wedding and in March of 2003 we got engaged!